Marine exploration is not only a prerogative of the military force, but is also developed for scientific means. It can joggle between different fields of study: biology, chemistry, ecology, geology or oceanography. Taking into account that the Earth is covered in water in proportions of 71 percent, scientists have the greatest enthusiasm to explore the unexplored parts of our planet, which are hidden on the deep blue oceans. Entire crews composed of sailors and scientists, or with individuals from both professions are monitoring the underwater life. The marine organisms present a great interest to scientists due to the oxygen cycle contribution that directly influences our planet’s climate. The existence of marine life that can survive on land proves that the water medium is similar in biochemistry with the terrestrial organisms, except for the fact that the water has a saline environment. Different temperature, pressure and darkness also affect the way life exists and develops in the water. 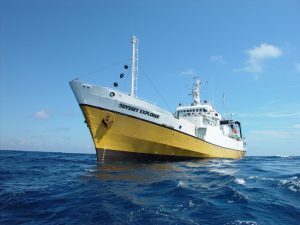 Civilian sailors make it possible for scientists to observe the life and different events that take place in water, but also affect the terrestrial continents. One such example is the Ring of Fire, in the Pacific Ocean. This area has an active and intense volcanic and seismic motion that translates in tsunamis and other events that through a ripple effect can have devastating consequences on land. The first global marine research expedition was held in 1872, with the HMS Challenger vessel. The ship travelled 70,000 nautical miles (130,000 km), time in which it discovered more that 4,500 marine life species. The results were published between 1873 and 1876 and were considered a milestone in human knowledge. A different branch of marine science is marine archaeology. It studies the remnants of human interaction with the sea, lakes and rivers. The material found helps researchers understand the dynamics of human interactions with the sea, from the prehistoric era to present day, but also the remnants of submerged aircrafts lost in recent years.